Nimbatus - The Space Drone Constructor, as the name might suggest, has you building drones, which you can directly control or give them some autonomous features. The closed alpha is extremely promising and a lot of fun to play with. Funded on Kickstarter back in December of last year, the amount of polish that's gone into it is very impressive. The new and refined tutorial, gives you a decent starting point towards making some really crazy drone designs. When I covered it last year, I noted how impressed I was with it and the fact that their Linux demo was immense fun to play around with. I was so impressed that I personally backed it. 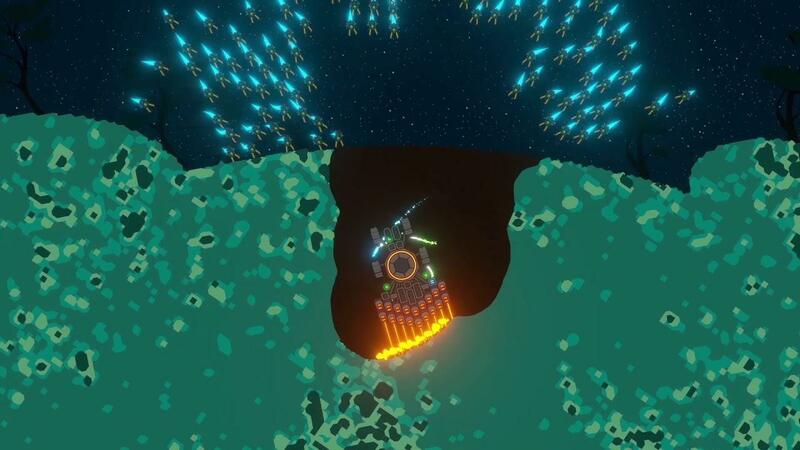 Since then, they've put out multiple updates to the closed alpha to add various new parts to build, new lava planets to explore and destroy, a temperature system for parts so they can freeze and overheat, new logic options like allow your drone to do something when a fuel-tank is empty or full and much more. What you can make, depends on your creativity and your understanding of logic gates. It can get a little confusing, but creating something basic that's still pretty sweet isn't all that difficult. Once you have the basics, iterating on that and making it completely ridiculous comes quite easy. The drone builder doesn't have annoying limits like only x amount of this allowed, so you can really do anything with it. Make a drone that fires off other automated drones, make a drone that's essentially a massive moving bomb or a fortified circle than spins while firing beam lasers—I've seen some really rather insane designs. What's excellent, is the Steam Workshop integration right in the game, so you can play with everyone's creations. To give you an example of something fun, I toyed around for a while and created a small fighter from scratch that prints (creates more) TNT rocket missiles. You control the thrusters on each missile individually, including a separate detonator for each and it's truly hilarious. It also has a logic block switch, allowing you to turn a shield on/off that covers the entire ship too. They're currently gearing up for an Early Access release on Steam and I think you're going to love it. There's no exact date for when that will happen, but I expect it will be very soon. Update: Early Access is now scheduled for October 3rd.